In a small bowl, combine sugar and cornstarch. In another small bowl, add half-and-half. Stir cornstarch mixture into the half-and-half. In a medium saucepan, cook half-and-half mixture over medium heat, stirring constantly, until thickened. Stir in vanilla. Remove from heat. Once slightly cooled, place plastic wrap over surface to prevent skin from forming. On a well-floured surface, roll Sweet Dough into a 13-inch circle; transfer to a 10-inch deep-dish pie plate. Add half-and-half mixture, and fold remaining dough over onto the half-and-half mixture. Bake until crust is golden brown, about 25 to 30 minutes. Let pie cool to room temperature, then refrigerate 4 hours before slicing. In a large bowl, combine flour, sugar, and baking powder. Using a pastry blender, cut in butter until mixture resembles coarse crumbs. In a small bowl, whisk together egg, yolk, milk, and vanilla. Add egg mixture to flour mixture, stirring until liquid is almost combined. Using your hands, work dough until it just comes together into a large ball. Shape into a disk. Cover disk with plastic wrap. Refrigerate 1 hour. OMG! My mom made this all the time when I was a kid. She made them in individual sized pies that you could grab and go. Thank you so much for posting. my grandmother used to make me this and ive often wondered how to make it . cant wait to try it! My grandma made these all the time , it was our favorite desert . Now a days they made only on Holidays not in my family it’s all the time . And she s used the sweet dough to make tea cookies .. They we’re an old time favorite cookies. Thanks for bringing great memories back . I couldn’t find our recipe due to a house fire. Thank you for sharing this recipe, I have been looking for this for years. My grandmother made this and passed away when I was in high school so I never got the recipe. I can’t wait too try out. Looking over this recipe, I don’t think I ever saw bouillie made without eggs. I agree. My grand mother’s recipie had about 3-5 eggs. Thank you ladies! I have NEVER heard of a tarte a la bouille without egg!! 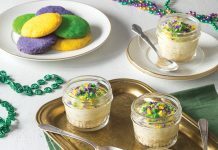 From Larose (Grandma Flo) to Thibodaux (Aunt Menola) and Labadieville (Grandma Blanchard), they all used eggs in their custard. Everyone else I knew used eggs in their custard, because the question was, just HOW MANY eggs do you use, more egg and less flour/cornstarch or less egg and more flour/cornstarch. Even in baking class at Nicholls, we did custard and it used EGGS!! I remember the chef telling me I should temp my custard so I didn’t scramble my eggs, if my temp got over 180 it would curdle. I laughed inside and told chef that I had been making custard since I was 13 and before then I was at my grandmother’s side as she made it. I knew just by the feel of the spoon when it was done. Soon as I felt it was right I inserted my thermometer and it read 178 degrees!! Perfect!! This must be how Rousses does their supposed pie, it is the most revolting excuse for a tarte a la bouille I have ever tasted! Are you sure you didn’t leave out the egg in the recipe? Even a creme anglaise, a thinner version of this, has egg. I am from Galliano, Lafourche Parish. My grandfather and his brother owned bakeries in Golden Meadow, Louisiana, and their father before them in Labadieville, Louisiana. We all used eggs in our bouillie. Jerome, this comes from my Nanny who lives in Leeville. “The bakery named Dufrene’s is closed. The one called Duet’s is in Galliano now, about 2 blocks past the Catholic Church, on the right on La. 1. ” I hope this helps you. Can I get your recipe for vanilla pudding pie. My husband calls it Booyee. Spelling No one got the recipe and he swears it was the best . His mom recalls that she almost would let the sugar burn if that makes sense. I am just trying to make his all time favorite dessert !! I would so appreciate it! Look at the recipe again. It calls for one large egg and one large egg yolk. 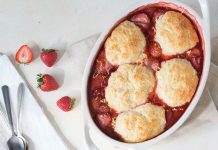 You may want to go back and re-read the recipe, then understand the reasoning for having two separate sections of ingredients and directions. 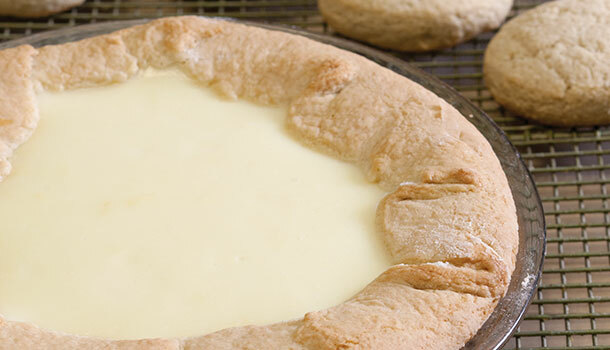 The eggs are used in the crust; no eggs are used in this recipe for the custard. If this were a recipe for the industry (professional bakers) more than likely only the ingredients would be listed for the custard and for the crust it would say to cream the sugar and fat, that’s it. A real baker or cook knows when it’s a custard what the proper procedure is and if it is a crust what the procedure is. Recipes are just for ingredients and amounts to ensure product consistency. This is in the receipt for the Sweet Dough..
there is a difference between an EGG CUSTARD PIE and the old Tarte au la Bouillie which was also called a MILK PIE by some old folks. I’m not saying some didn’t add eggs, that would have been the chose of the cook, BUT the old milk pie was made like this recipe. Thanks for the old saying YOU never get to old to learn. This wasn’t the recipe she used for the Bouillie (custard), but seeing it brought back such great memories. I actually found her original recipe in a New Iberia, La. cookbook. The Bouillie (custard) part she would make (without the pie dough) for special treats, especially in cold weather. The dough made delicious cookies. As for the Tat’ au la Bouillie (the pie), she would make 10 at a time and freeze them, so that when family from out of town would come in, she just had to take one out for them to enjoy. It wouldn’t surprise me if Ms. Alzina had a few different recipes for her Bouillie, but this is the recipe she gave to us. We’d love to get our hands on that book! When I was 4 or 5, we had a non english, Cajun renter who liked making these for me. Only, they were Pink, and tasted like strawberries. I didn’t have enough Cajun french to find out how she did them, but my Mama said she used flavoring and color. Actually, Mama was a bit joalous I think! Anyone ever ate any like this? I can taste it in my mind still, and I am 76. So, it’s actually “tarte à la bouillie,” not “tarte au la bouillie.” My grandma used to make it every year too! Ma grand-mère a fait ça chaque année aussi! according to the recipe in her recipe book Cajun Joy this recipe omitted 1egg and 1 stick of butter, also you can omit the half and half ,for 1 (13oz) can evaporated milk and 1can water. Ms Barbara, i have tried so hard to get a copy of this cook book. I cant find one anywhere. Where did you get yours? St.Joseph’s Catholic Church in French Settlement sells the milk pies for two weekends every October. They sell hundreds of these and people come from all over to buy them.They have been doing this for many years and people look forward to it. St. Joseph Church in French Settlement, Livingston Parish, LA. The youth group has a milk pie fundraiser once every year.. I buy several pies every time. They are Delicious! My maw Laura, (Laura Lambert) used to make them. They were the best. I just wish they would sell them more than once a year. Is this recipe like the one the catholic church uses? I would love to try to make them myself so I can eat them year round lol. Do you have a local recipe from French Settlement? This was my first pie I’ve ever made from scratch. Definitely worth the effort. Wish I would have made more than one because it’s already almost gone! I’m not from Louisiana but I must say……I’m going to make this torrow! I’ve also enjoyed each and every one of your posts! Happy New Year! My late Aunt Inez made these all the time. To say I loved them is an understatement!!!! So glad to have this recipe. Going to try this very soon. Thinking about making them brings a smile to my face. Raised in the country of south Louisiana, my granny and mom made these plenty often. We sometimes had the “bouille” served warm for breakfast, Momma called it porridge. She made this without eggs, maybe she used the eggs for other recipes when they were scarce. She made custard sometimes too and for that she used eggs. I made this particular recipe and it tastes exactly like the “bouille” that I grew up on! Yummy!!! I’m from St. Amant, Louisiana. My Maw Maw made these pies every year, NO eggs. She said with eggs was called a custard pie. She called them PAP pies. Would anyone happen to know where that would have come from? She has passed away and we are just trying to figure it out. My husband’s grandmother made this “milk pie” . It tastes just like hers did and I remember she was adamant that eggs did not go in the milk! 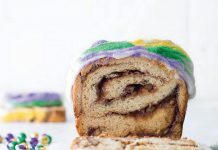 We live in SW Louisiana, and sometimes a recipe by the same name can vary greatly from one parish to the next. But I do know in our neck of the woods that eggs are only in the sweet dough. This recipe is delicious! Wanda Toups ,please send me your resipe. I made the recipe as-is but added two egg yolks and it turned out great. I don’t have the recipe either. I don’t remember what it was called. I don’t th8nk we called it hiccup cake though. If I find it I’ll share with you. YUMMY, especially the dough itself. They sell Ms Alzina’s Cook books at the Cajun Pecan House in cut off ! My mother made the bouille au lait without eggs. My aunt used to make this when I was young. She would use fresh milk from an old man named Nasta primeaux. I think the ones my aunt made with the fresh milk was better than Amy other I have ever had. My Grandmother from Galliano, LA used to make these Tartes. She made one with Coconut instead of Custard. If anyone has this recipe, please send it to me at ronniecheramie@att.net. I would love to make these for my Dad. If anyone would like to try one, Frank’s Supermarket in Des Allemands, LA ,makes a pretty good tarte la bouillie, but only between October and December. My grandmother made these quite often and I regret not getting her recipe. Thanks for sharing.